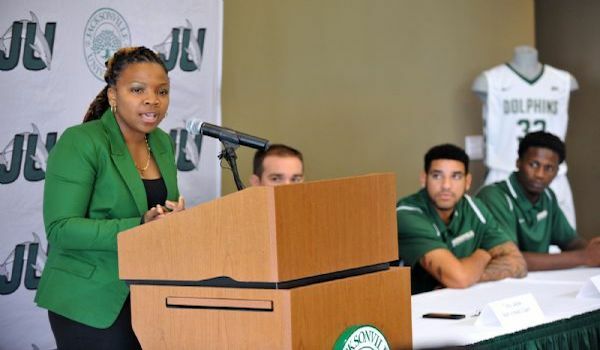 When Yolett McPhee-McCuin arrived at Jacksonville University in 2013, she inherited a program that was coming off of three straight losing seasons. She immediately implemented a vision that she believed in and a “No Ceilings” mentality, which has since resulted in three straight 20+ win seasons and post-season berths, as well as the first Atlantic Sun Tournament Championship and NCAA Tournament berth in program history. What would you suggest the top three priorities be for a first-time Head Coach once taking over a program? One, make sure that you surround yourself with people that truly believe in your vision and not just there to get a job. If they believe in your vision, they will do their best to make sure that it’s fulfilled. Staffing will make or break you. Three, make sure that your players understand that although they didn’t pick you, you picked them. No matter what the circumstance is, we owe it to those players to help them grow as young people. What strategies did you implement since your arrival at Jacksonville that have remained consistent as you have rebuilt the program? Making sure the standards of the program are followed on and off the court, which is the basis of our “JU WAY” culture. It is important that we are never making exceptions or turning a blind eye to the “JU WAY”. Transparency, which allows our ladies to grow into the young women they ultimately want to be with our guidance. How do you empower your staff members? I first show them what I want. Once they’ve gotten what I want, I allow them to add their own “spin” to it. I also use the phrase “what do you think” a lot. I’m a learner so I’m always open to new suggestions, ways, and ideas. All of my coaches have a voice in practice; they can stop practice and interject. I also allow my staff members to be the Head Coach of their position. I challenge them to “own it” and treat it like it is their own. Knowing what you know now as a successful DI Head Coach, what are a few things you wish you would have known as an Assistant Coach prior to becoming a Head Coach? As much as I conversed with Head Coaches as an Assistant Coach and studied them, there was no true understanding of what they go through on a daily basis. I think I would’ve had more compassion and respect for their position. I also didn’t understand the feeling of being in charge. As the leader, your failure affects everyone under you. That’s a lot to bare, so I think I would have been lower maintenance knowing my Head Coach deals with so much more on a daily basis.